In preparation for Concert Band. Information for the Big Top Suite for orchestra below. 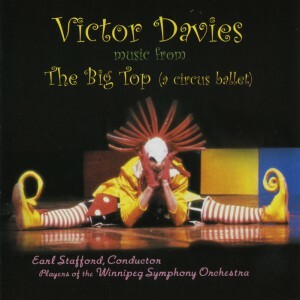 Colourful tuneful selections of the circus act music from The Big Top (a circus ballet) commissioned by The Royal Winnipeg Ballet. Suite premiere: Toronto Philharmonic Orchestra, Paul Robinson, conductor, Oct 27 1991, also: Toronto Symphony Orchestra, National Arts Centre Orchestra and Saskatoon Symphony Orchestra, Earl Stafford conductor; Mississauga Symphony Orchestra and Georgian Bay Symphony, John Barnum, conductor; Georgetown Symphony Orchestra; Vancouver Youth Symphony Orchestra, Arthur Polson, conductor, also performed on their European and Australian tours; Hamilton Philharmonic Orchestra, Howard Cable, conductor. CD of the complete ballet The Big Top includes the sections which make up the Suite.